Today’s post features a self-drafted triangle bralette made from a poly floral charmeuse fabric. There were a number of new techniques that I wanted to try out and I kept that in mind while drafting the pattern. For one, I had been wanting to make thin spaghetti bra straps. I don’t normally make my own bra straps since I have nice strapping elastics in my stash, but this floral fabric has a fantastic print and I wanted to use as much of it as possible. Another new technique I had wanted to try was to create an elastic casing for the bra band. What I learned is that it is extremely difficult to make a narrow elastic band with clean finishing! I wanted an itty bitty 1/2″ band and it was impossible to encase the cups in the 1/2″ casing and then turn the bralette right side out. I actually tore the band fabric the first time I attempted to set the band. Without going into too much detail (because there’s a tutorial forthcoming), I managed to set the band on my second try. This is the first iteration of what I think will be a staple triangle bralette style in my closet. I envision that this style will work quite well with silky/satiny fabrics with slight stretch to them. I also made the elastic too short…will add about 1″ – 1.5″ of elastic to the band when I make the second iteration. This red/green/off-white lace is from a Merckwaerdigh Bra Kit that I bought a long time ago. I loved the lace so much that I actually bought two of the same kits so I could have more of this lace. I used some over a year ago to make this Watson Bra, and then I hoarded it away for a worthy project. I finally pulled it out from my stash this year to make this set. The bralette pattern is the same as the balconette bralette styles found here and here. The hi waisted underwear pattern is the same as this pair here. The only change I made to the underwear pattern is to make the gusset narrower. Happy Wednesday! I’m back with another balconette bralette. This time, it’s made from a gorgeous red/gold lace from The Emerald Studio. 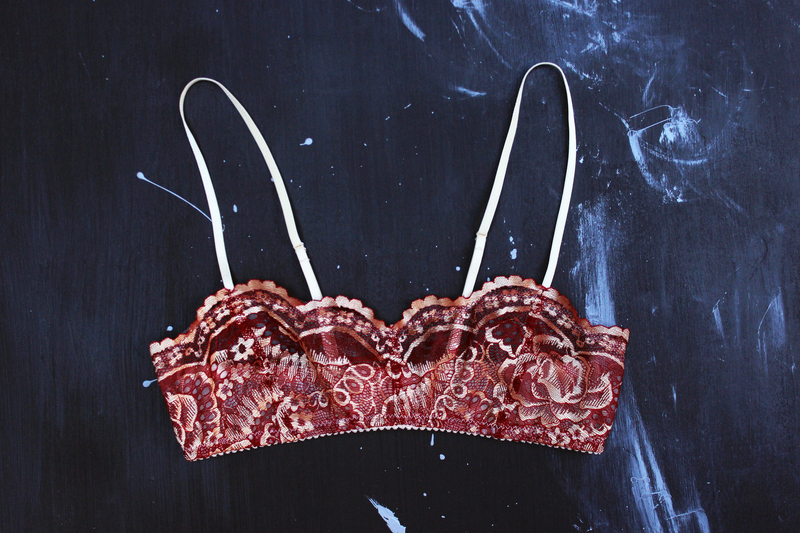 When I received the lace, I knew I had to make it into a balconette bralette. 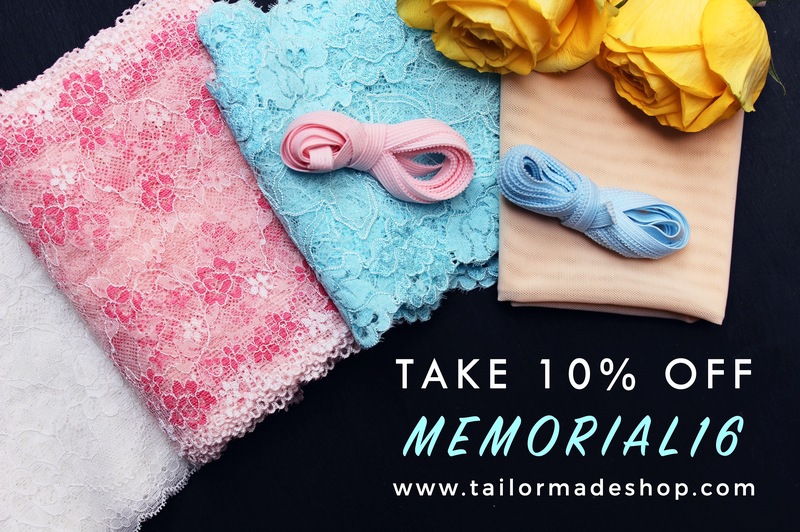 I designed the style to work with non-stretch laces that have scallop edges and this lace fits the bill perfectly. Also, I must confess that I’m pretty obsessed with this shape right now so you may see a few more of these balconette bralettes in the coming posts. After making so many triangle bralettes, I wanted to try a new shape. Using my own measurements, I drafted this balconette bralette. 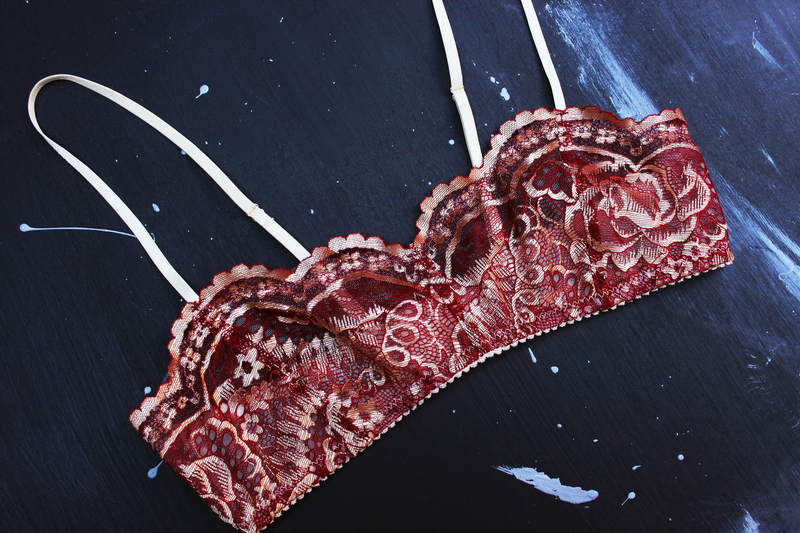 Unlike the other bralettes that I’ve made, this one is made with a non-stretch lace. It only has mechanical give, which means the front part of the bralette is pretty stable and doesn’t really stretch. The back part of the bralette is made from stretch mesh so it can stretch around the body when worn. The straps are set further apart than usual, like that of a balconette bra. What do you guys think about this style? 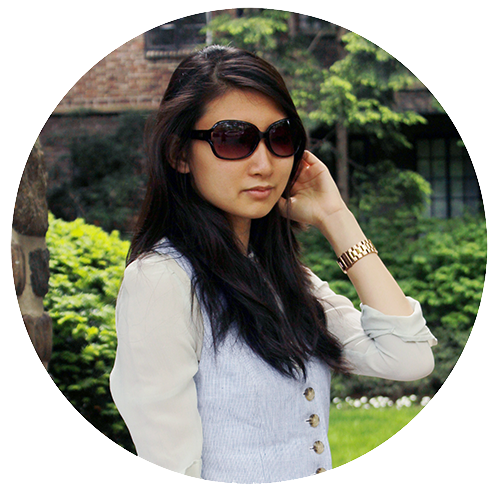 I have a special project for today’s blog post. 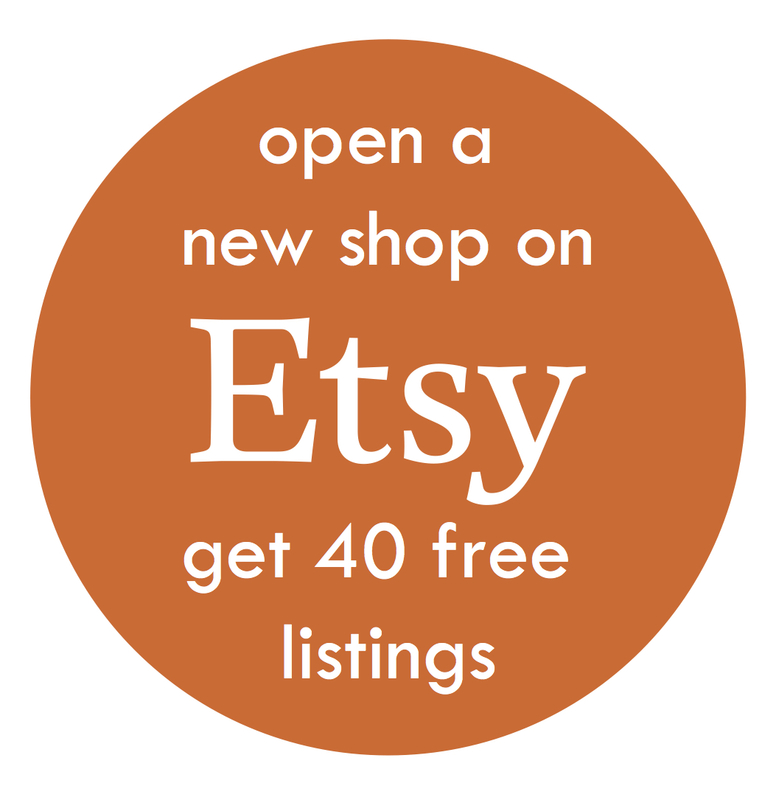 Last week, Sarah of Ohhhlulu posted an announcement on her blog asking for pattern testers to test her new pattern collection. I was selected to make the Peridot Bralette & Bryony Knickers. Hi guys, I’m back with (yet another) Marlborough Bra project! This particular Marlborough Bra was inspired by Lonely’s Bib Bra. Inspiration for this Marlborough Bra: Lonely’s Bib Bra. The bib portion is removable and you can wear the bra without the bib. It’s attached to the bra via G-Hooks. This bra is made from a teal/peach bra kit that’s available in my shop. What are your thoughts? Do you like the addition of the removable bib? Share in the comments below! Last year, I modified the Marlborough Bra cup so that it has a horizontal cup seam with split lower cups. This time, I decided to adjust the style lines so that there is a lower cup and split upper cups. 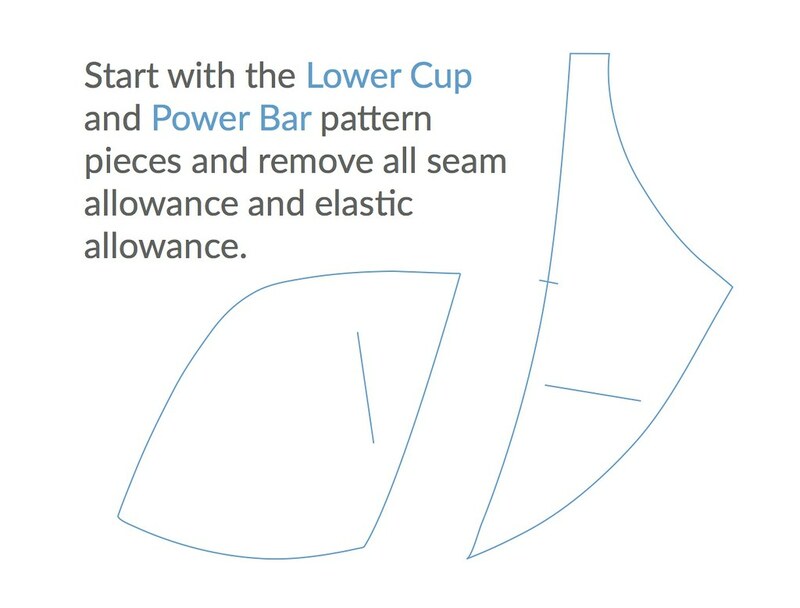 If anyone is interested, this is how you do this particular cup seam modification. 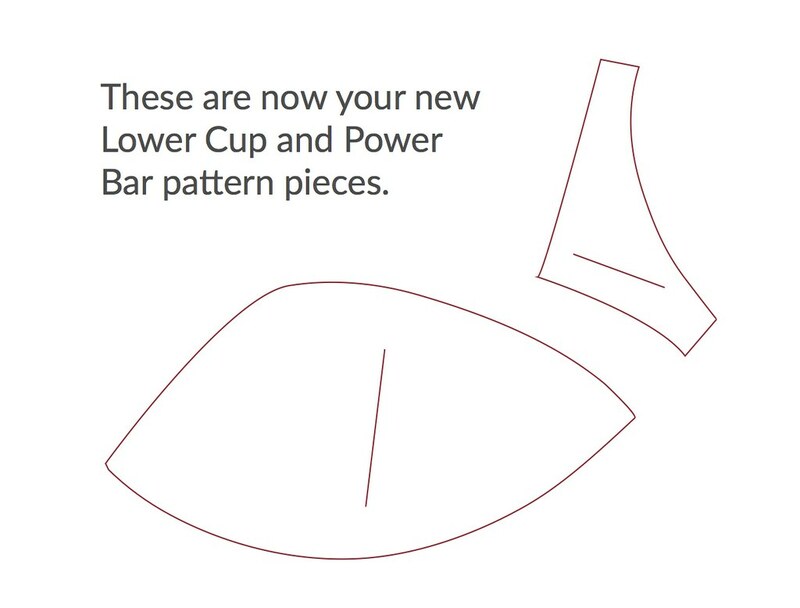 First start with the lower cup and power bar pattern pieces. Remove the seam allowance and elastic allowance. 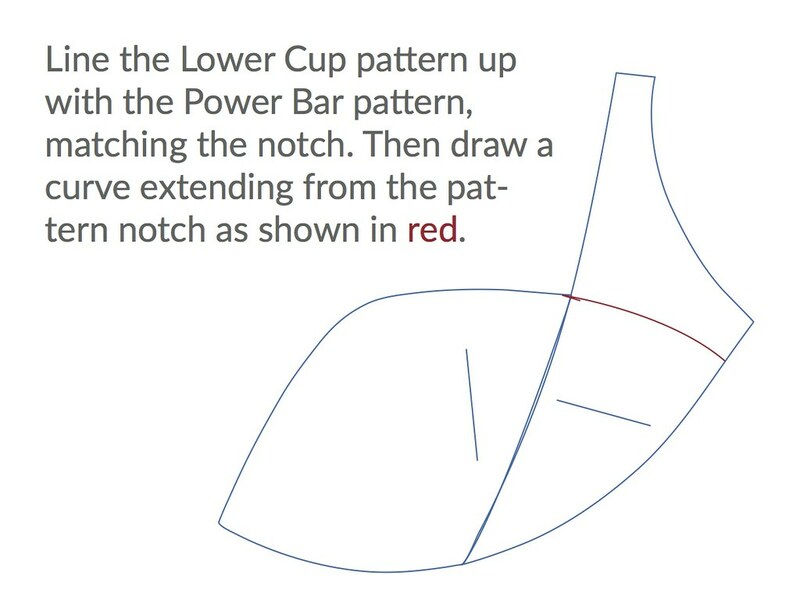 Line the Lower Cup pattern up with the Power Bar pattern, matching the notch. Then draw a curve extending from the pattern notch as shown in red. 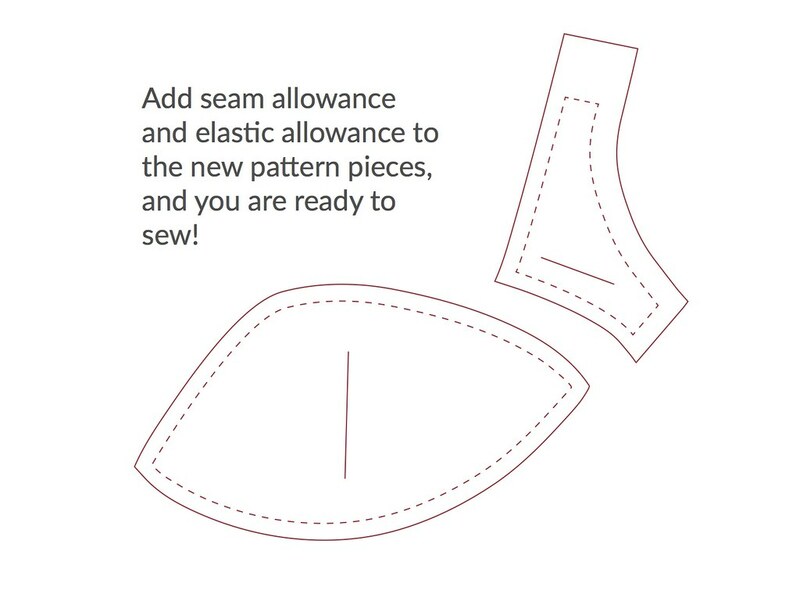 Add the seam allowance and elastic allowance back and you are now ready to sew! For this modified Marlborough Bra, I also decided to apply the bra channeling on the outside. I’ve seen it done on RTW bras, and I wanted to give it a try. The process is straight forward. Sew the bra cups into the frame with the seam allowance on the right side. Then apply channeling as you normally would on the right side of the bra. I thought this was a pretty cool technique. Have you ever tried applying channeling on the right side of the bra? How did it go? Did you like the result?